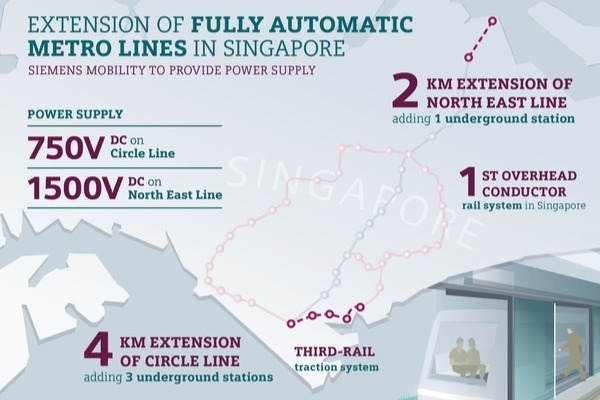 Siemens has been awarded a contract by Singapore’s Land Transport Authority to provide power supply systems for Circle Line Stage 6 and the North East Line extension. The order, worth more than SGD 111 million, covers the delivery of AC and DC electrification equipment, and the Overhead Conductor Rail (OCR), the first-of-its-kind to be deployed in Singapore, for the extension of North East Line. The 4km Circle Line Stage 6 (CCL6) will close the loop for the Circle Line (CCL) by connecting HarbourFront Station to Marina Bay Station. To be completed by 2025, it comprises Kim Chuan Depot Extension (KCDE) and three new underground stations – Keppel, Cantonment and Prince Edward Road. KCDE is a northward expansion of the existing Kim Chuan Depot, to cater for the increased capacity of Circle Line from 70 to 133 trains. CCL6 will support direct east-west travel and reduce travel time. The 2km North East Line extension (NELe) comprises three additional stabling tracks in the NEL Depot located in Sengkang, and one new underground Punggol Coast Station. It is scheduled to be completed by 2023. The NELe will bring rail connectivity to Punggol North, which is being developed into an attractive live-work-learn-play environment for residents, workers and students. “With the extension of Circle Line and North East Line, Singapore commuters will have greater connectivity, accessibility and time savings to different parts of the country. Siemens is pleased to play a part in improving Singapore’s land transport infrastructure by powering up CCL6 and NELe, just as we’re doing for the Downtown Line,” said Michel Obadia, CEO, Siemens Mobility Pte Ltd.
For NELe, Siemens will provide its state-of-the-art aluminium overhead conductor rail system (OCR), Sicat SR (Siemens Catenary System Standard Rigid). It meets the requirements of a modern mass transit system perfectly. Compared to conventional overhead catenary system, such as the existing 1500 V DC system for the North East Line, Sicat SR requires lower installation height, eliminates the use of tensioning devices and has low voltage drop. It also has high current carrying capacity, high short-circuit strength and contact wire wear of up to 43 percent, resulting in longer equipment life.